First, banning trade (of inert metal and plastic recycling, or reuse and refurbishment) over unmeasured byproducts and untested allegations (what percentage is improperly disposed "e-waste") will retard the economic development of the youngest and weakest emerging nations. They cannot afford to buy new computers. Senegal's priority right now is not a "Microsoft Authorized Refurbisher" license. Angola, Cameroon, Ghana etc. should be pirating and skimping and bootstrapping, they should be refurbishing and repairing and fixing. Those activities bring economic value to the best and brightest young people in those developing countries, the "Geeks of Color" who turned Korea, South China, Singapore and other tigers from LDCs into economic superpowers. It is the opposite of the "Resource Curse" (where economic value can be controlled by simple might and guns). The second tragedy is a corollary - the OEMs are cutting the throat of tomorrow's market. They cannot continue to grow by making last year's product obsolete, changing OS or television broadcasts. To grow at the scale they want, they need these young economies to get on their feet, get access to the internet, and develop a middle class which will lead to greater sales in the future. Microsoft should eagerly want to see these Geeks of Color learning to use their Operating System, not worry whether a med school student in Lagos has a "legal" license. Asia appears to be awake to this, and is exporting refurbished electronics to Africa, and is investing in SKD factories in Egypt, South Africa, and Madagascar. Third, the USA does not have money to waste shredding working equipment. The USA has a trade deficit. Reuse items represent "value added". Shredding a dollar bill and selling it for the value of the waste paper will result in the same transaction measured in kilograms, but our economy cannot afford to take materials (like 5 year old computer monitors) and shred them into raw materials. Fair trade - properly inspecting and removing bad components prior to export - creates more USA jobs than "no intact unit". Shredders are mainly designed to reduce workforce. Manual disassembly can only be justified by human ability to recognize and preserve reuse value, something the machines owned by GEEP, Metech, and Sims cannot do. Ultimately, the questions whether to allow the marketplace to redistribute affordable refurbished and used displays reminds me of the Malthus debate. "That the increase of population is necessarily limited by the means of subsistence," can certainly be applied to finite accessible supplies of copper, coltan, rare earth metals, and energy. 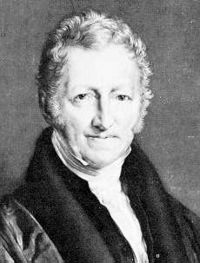 Thomas Robert Malthus, the English philosopher, argued that starvation is a natural barrier to overpopulation, and has been used by others to argue against food aid to starving countries. The same thesis could certainly be applied to the hard rock metal mining and energy use which comes from expanded access to electronics... the more people who own a computer, the more carbon and mining will result. However, like the argument against Malthus, I would like to believe that a healthy and upwardly mobile population tends to care more about extinction and care less about having very large families. Where the standard of living has increased, the birth rate has dropped. So I'm not in favor of starving Africa, nor am I in favor of making the internet completely unfordable. Selling to poor people certainly does increase "uncertainty". Shredding equipment into little pieces certainly shortens the flow chart, and I guess that reduces "uncertainty". I see a lot of discomfort in the "uncertainty" of selling anything to anyone in a poor country. The more humans are involved, the less control of the "final outcome". 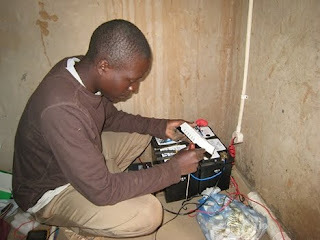 NO INTACT UNIT policies draw the shades on the people outside who are willing to replace capacitors, fix boards, or burn wire to keep from starving. But if you actually spend some time in developing nations, as I have, you learn that the loyalties and friendships that people carry mean more to them than a new car means to you or me. And that is really kind of refreshing. During my time in Peace Corps, I think I laughed and had more natural dopamine from friendships, loyalties and relationships than I could ever get with a new I-phone or X-box. For me, that is the part of the trade with developing nations which the USA gains the most from. It leads to nothing less than world peace. Fair Trade Recycling has a social and spiritual multiplier effect which critics of e-waste exports may be completely tone deaf and blind to . The main certainty is this: The worst real recycling (as opposed to disposing and saying you are recycling) is better than the best mining. We want the developing world to make their money from evolving cleaner and cleaner recycling and repair operations, not by mining coral reefs and rain forests for the copper, zinc, lead and tantalum we need for our cell phones, and not by denying poor nations access to used cell phones when they cannot afford new.